Dodger legend Fernando Valenzuela made an appearance at a Superior Grocers store in Huntington Park. 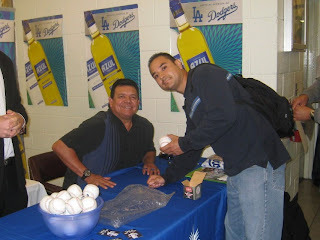 This is the fourth time I have been to a Fernando Valenzuela signing but it's the first time that I got him on camera. This event had a catch. A bottle of Tenampa Azul Tequila had to be purchased in order to receive an autograph. I don't drink tequila but I had to purchase the bottle to obtain an autograph. Customer's were able to purchase as many bottles as they wanted. Every bottle purchased entitled you to one autograph. Buy one bottle and get one autograph. Buy two bottles and get two autographs. Get the point? I purchased one bottle and finally got a Fernando Valenzuela "sweet spot" baseball. After getting my ball signed I got back in line to get a signature on the bottle. How often does Fernando sign tequila bottles? Not often. Items per person? Depended on how many tequila bottles purchased. Free signing? No, purchase was necessary. Price of tequila bottle? $15.99 each. Customer's had the choice between gold or silver bottles. Fernando signed my tequila bottle nicely on the side. 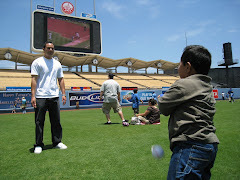 Fernando signing an autograph for a kid. Fernando asked me "on the sweet spot"? I said "si por favor". I recorded this video below of Fernando signing at the store. Thanks to Superior Grocers, Tenampa Azul Tequila and Fernando Valenzuela for this event.